As you read this, dear readers, I’m on the cusp of releasing Pursuit, Lewis Legacy Series 8 (technically Book 9 when you include Prelude, the prequel to the series). Pursuit is the story of NASA Commander William Jordan Lewis, chosen to command a mission to the International Space Station in late October 2007. Admittedly, Will’s story is one I’ve been leading up to with great personal anticipation. I drafted all the books in The Lewis Legacy Series (with the exception of Prelude) a number of years ago, and Will has been mentioned in all but one of the series books (Moonbeams). Commander Will was finally introduced to readers in Abide, the most previous installment of the series with Catherine “Caty” Lewis, the youngest Lewis daughter. Pursuit is the second book in the series which takes a new direction in telling the stories of the younger Lewis siblings (youngest brother, Carson Lewis, will get his turn in the final book, Assurance). As always, in Pursuit, you will be brought-up-to date on the Houston-based TeamWork Missions volunteer members led by Sam Lewis (the core character in the series whose love story with his wife, Lexa, is told in Lewis Legacy 1, Awakening). Physically, Will closely resembles his older brother, Sam, and he’s three years younger and two inches shorter (meaning he is 6’ 3”). However, Will is different from Sam in pursuing a lifelong and single-minded focus on space exploration. Will also finds social situations awkward, especially with a woman who’s not scientifically minded, and that makes for some interesting dialogue. Will’s mission is the first full crew of seven astronauts since the tragic loss of STS-107 shuttle Columbia on the first day of February 2003. When I originally wrote this book, I knew it was unique and special. I invest myself in every character and story I write, but no matter how many books I may write in the future, I can say with absolute certainty that Pursuit will always be one of my personal favorites. I believe this is so for a number of reasons, among them my personal love of flying and fascination with NASA. 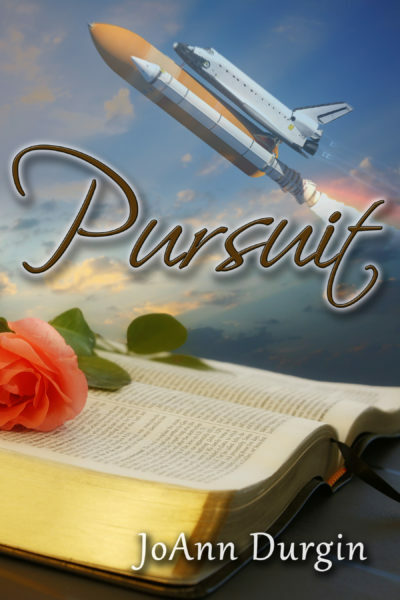 Pursuit has adventure, a great love story (on several different levels), humor, faith, family, suspense… But ultimately, at its core, Pursuit is the story of how one person can change the world for Christ in revealing the power, mercy, and grace of our great God. I can be fearless and relentless in seeking answers when it comes to my characters and their stories. For this particular story, I did an unprecedented amount of study. I loved every minute of it. For every fascinating true story of astronauts related in this book, I have ten more. Following the American Christian Fiction Writers Conference in Dallas in 2012, I visited Johnson Space Center on a rainy Tuesday morning in September. My husband, Jim, and I explored as many of the exhibits as we could. I ran around NASA and talked with, questioned, and pestered every technician, tour leader, and staff member I could find with questions. No wonder the woman in one of the gift shops tried to hide when she spied me coming through the door! Perhaps the one overriding question from the NASA staff was “What’s the name of your shuttle?” I was thankful when every one of them agreed Pursuit was an awesome shuttle name. From the time he was a little boy, all Will Lewis wanted to do was ride a rocket to the stars. Now, more than three decades later, NASA Commander William Jordan Lewis prepares to lead his seven-member shuttle crew in STS-777 Pursuit on a six-week mission to the International Space Station. Nothing and no one will interfere with his single-minded focus. Then four months before his mission, Will meets his new neighbor in the condo next door—a petite woman with a sweet Southern accent and a masculine-sounding name who challenges, intrigues, and completely captivates him. Climbing out of his car, Will turned and tried not to frown. After a rough day with the botched simulation and an unruly, disgruntled crew member, the last thing he wanted was to make small talk with his neighbor. She’d moved into the condo next door a couple of months ago, maybe three. Time had a way of escaping him lately, and the days tended to overlap. Until now, they’d only exchanged a wave in passing. He’d be content keeping their relationship limited to similar brief encounters. If she’d allow him to do that, they’d get along fine. At the moment, that prospect seemed unlikely. Will removed his sunglasses and graced her with his best attempt at a smile. “Hi there.” He’d feel better if he could remember her name. Of course, it couldn’t be something simple like Kate or Emma. His recall for all things scientific was phenomenal, but this woman’s name? He hadn’t a clue. All he knew was that it was something unusual and didn’t sound particularly feminine. “Not today.” Clicking open the trunk of the car, he pulled out a couple of eco-friendly, reusable grocery bags. Surely she wasn’t mocking the space program. That would be downright anti-American, but it wasn’t like he hadn’t heard all the jokes before. Her dark hair, pulled back in a ponytail, bounced around her shoulders as she walked closer. Bright blue eyes with a hint of gray surveyed him with open curiosity. Up close, she was very pretty in a perky, cheerleader way—fresh-faced with deep, appealing dimples etched on both sides of her mouth. Although petite, she appeared well-proportioned and physically fit in her shorts and T-shirt. He could appreciate that. She must have been gardening or planting as evidenced by the gloves she tugged from her hands and tossed on her driveway. The smudge of potting soil on her right cheek was oddly beguiling although it was highly possible his brain was functioning on overload. “Oh, here. Let me help you with those.” She crossed the grass dividing their driveways to stand beside him with an approving smile. “Good to see you’re doing your part to save the environment.” As if he needed her approval. When she reached for one of the bags, Will handed it over. Call it a hunch, but she didn’t seem the type to accept no as an answer. He retrieved the other three bags before clicking his key fob to lower the trunk. After she slung the bag over one shoulder and walked toward his condo, Will caught a whiff of her scent in the downwind. Reminded him of a combination of vanilla and something else he couldn’t immediately define. Potting soil? The vanilla won out, bringing to mind his mother’s oatmeal raisin cookies. He’d been craving them lately. That’s probably all it was. Standing by his front door, his neighbor watched as he walked toward her. He was used to people looking at him, but she seemed more curious than in awe. No doubt with her outgoing personality, this woman would fit right in on the cul-de-sac, at least from what Will knew of their neighbors—families, older folks, and enough kids to be lively without being overly annoying. “My name,” she said. “It’s Dalton Smith.” She stuck out her hand. “Thanks. I think.” Her cheeks colored pink which surprised him since nothing about the woman struck him as shy. Did she think he was flirting? Was he? Was she? Maybe it was a combination of both. He’d never been inclined to engage in much flirting, so he wasn’t sure he’d recognize romantic interest unless a woman knocked him between the eyes, kissed him, or hauled him off somewhere. “You’re welcome.” She turned back to face him, her smile slightly less enthusiastic. What was she waiting for? A tip? “They’re my favorite,” he said, lowering his bags to the counter. “Prizewinning?” Her lips tipped in apparent amusement. This conversation was going nowhere fast. “And, by the way, that was a compliment.” She brushed past him on her way out of the kitchen. As you read this, I will be traveling on my way to Florida. I will check in when I can and comment. I’ll miss your post but will keep up with you on FB. Enjoy your time! Blessings JoAnn, even though you won’t be ‘here’ anymore, you will remain in my prayers. Thank you, Wemble, and I will miss you, too. I will certainly pop in on Inspy quite often, so you’ll “see” me from time to time. :) Thanks for the prayers; they are always appreciated. I found a link that has the for King & Country concert that we saw (minus Lauren Daigle). It was a fabulous concert. Best of the New Year to you! Thank you, Jill, and the same to you. I’ll look forward to seeing your book on the shelves soon and see you on Facebook! Blessings to you in the New Year. I already miss reading your posts and hearing first hand about your books. Thanks for sharing your life and work here at InspyRomance. I first learned about it from you and since then have followed it and got to know a lot of new authors. I have been waiting for Pursuit for a while and your post has excited me even more, specially when you say great things about it from your perspective as an author (such as personal favorite). Happy new year and best wishes in your new endeavors. For a second there I thought about stalking you (on FB) and checking out if you arrived well in Florida, since it’s not like you not to reply to our posts. I’m guessing it was a long trip, but hope you made it all right. Enjoy the break! Thank you for the prayers. I really appreciate them as baby Sam continues to grow (and move a lot). He particularly enjoys waking me up early morning (yes, already), which has been when I’ve been catching up with my reading (slowly getting through By Grace Draw Near and loving it– the ballroom dancing scene I read this morning was fun). We will miss you JoAnn. Best wishes for your future pursuits. I’m glad you enjoyed the excerpt, Kathleen! :) A reader told me yesterday that she knows a high school girl name Dalton (and her sister is Dillan). So, I guess it does happen. I almost changed her name, but the Lord gave it to me for a reason. So it stayed. Blessings to you! Thank you, Autumn. I know we’ll be in contact. :) Blessings to you in the New Year. Blessings to you as you leave the blog to seek other pursuits (do you see what I did there?) I enjoyed rooming with you at ACFW and will keep watch for your comings and goings on Facebook. Sending you big HUGS, Deb. You put up with me at the ACFW. That one was so disjointed, but I truly enjoyed the fellowship with my roommates more than anything! :) Yes, we’ll always have Facebook. Wishing you blessings in the coming New Year! It’s been fun to read your posts. I’ll look forward to seeing you on Facebook. Thanks for sharing the concert video. I wasn’t able to go to it so this was fun to see. Thank you, Marylin, and same here. I appreciate that you’ve taken the time to read a couple of my books since I know how large/tall your TBR pile is these days. Wishing you abundant blessings in the New Year, and yes, see you on Facebook! Yes, we’ll miss your posts here. Thanks for the excerpt. Sounds intriguing! Can hardly wait to read the book. I’ll miss seeing your posts here, JoAnn. I loved your snippet from Pursuit. It sounds so intriguing, and I’m looking forward to reading it. When is your release date? Oh man, JoAnn. I just found this blog. I really enjoyed your post and I love the scripture. I’ll miss reading your posts, JoAnn! I loved reading the excerpt from Pursuit, and I look forward to reading the book. Thanks for your comments and writing. God bless your new endeavors. I grew up watching lift offs on TV. Dad worked for NASA. I’m sure I would enjoy that series. I’m surprised I haven’t noticed it before. Great excerpt! I look forward to reading this book. Happy New Year! JoAnn, you will totally be missed around here! You’re the one who invited me before this beautiful site launched, and I thank you again for that. I’ve enjoyed your articles as well as those from the other ladies in the group. I wish you the best in whatever your next adventure is. May your future be blessed!